Ryan took his first improv class after making a New Year's resolution to try one new thing a month. Since then, improv has become a passion. After finishing WIT’s level 3 class, Ryan started volunteering as a way to see more shows and get discounts on classes. Ryan has continued to volunteer because he finds it rewarding to be a part of the WIT community. Volunteering also allows him to meet fun and interesting people and learn more about improv. He also likes getting complimented on his selection of music during shows. If your team enters to Cover Girl by RuPaul, Ryan is most likely in the booth. Originally from New Hampshire, Ryan came to the DC area for college, left for law school, then moved back in the Summer of 2012. Ryan first dabbled in improv by taking two classes at DC Improv. His life changed after attending WIT’s Improvapalloza later that year, not knowing what it was. Ryan had never seen anything as funny or creative as the shows that weekend. 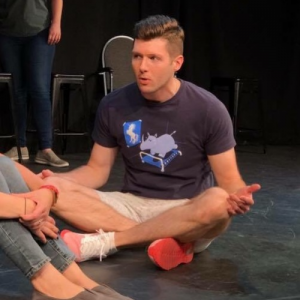 Since then, Ryan has dived head first into improv, completing the WIT curriculum, taking workshops, volunteering, and performing with indie teams. His current indie teams are Something Else! and Mind Map. In addition to improv, Ryan plays in the Stonewall Bocce league with his team Valley of the Balls. He also enjoys tabletop games. Ryan dreams of one day having a Pixie Bob cat.